A Fokker 50 passenger plane with 44 people on board, operated by local air carrier South Supreme Airlines, at Wau Airport in the recently independent country of South Sudan at around 3 PM local time (12 PM GMT), according to local media and observer reports. The crash reportedly happened during landing. 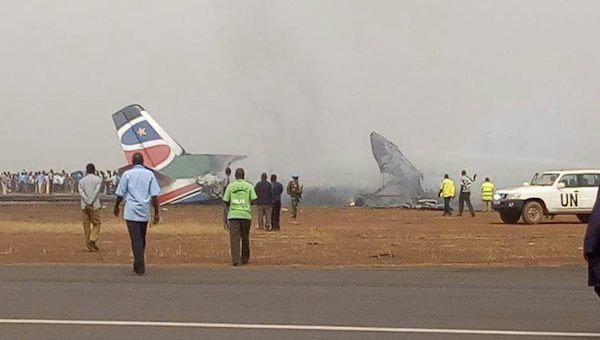 The passenger aircraft was flying from the country’s capital Juba. UPD (4:45 PM GMT): Local officials have confirmed that 14 of the 45 people on board are injured. So far, no news of casualties has been reported. Soon after the crash, the local National Courier news outlet published pictures showing the crashed remains of the aircraft on their Twitter account. Reuters quoted one aid worker on the site of the crash saying that no one died in the incident. Local authorities are yet to provide details on the number of casualties but the country’s Eye radio station already reported that nine people had been retrieved alive and taken to a nearby hospital. South Supreme Airlines is a South Sudanese carrier that began operations in September of 2013, based on the fleet of defunct Feeder Airlines consisting of two Fokker 50 aircraft.